Off-road racing has enjoyed a long history here in the Laughlin desert. Some entities have come and gone, enjoying their heyday, then leaving in the same cloud of dust they created when they first arrived. Other entities have come along, envisioned potential for bigger and better opportunities, and resurrected strong competitive events for drivers who love a challenge. 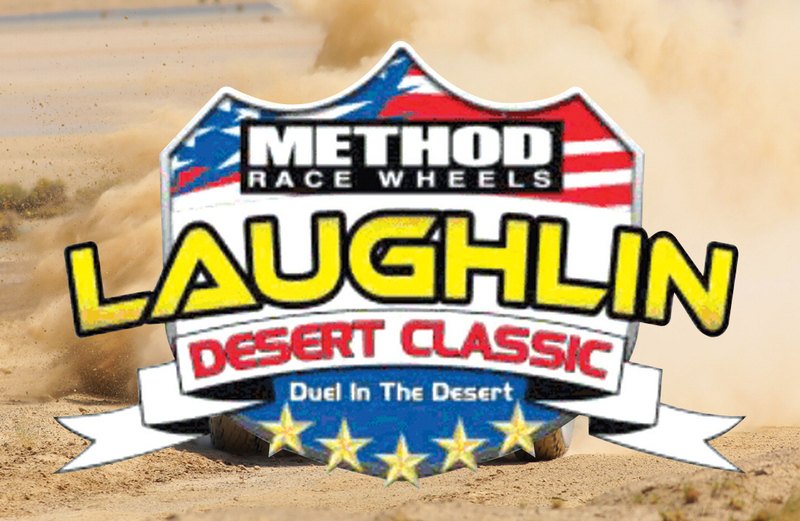 Enter Best In The Desert who returns with the third annual Method Race Wheels Laughlin Desert Classic presented by Polaris Thursday-Sunday, Oct. 11-14, at the Laughlin Events Park located at the corner of Bruce Woodbury Drive and Thomas Edison Drive (a short drive up from Casino Drive and the entrance to the Edgewater). “At Best In The Desert Racing Association, our goal is to make certain competitors’ experience with us is nothing short of exceptional,” said Donald Jackson, operations manager for Best In The Desert, the sanctioning organization for this race. To that end, each event is knowledge gained to ensure their participation and enthusiasm to the sport of off-road racing meets the professionalism they expect and deserve. Sponsored by the Laughlin Tourism Commission, the event is also spectator friendly with new events added this year for more excitement for all ages. “This is our third year working along with the Laughlin Tourism Commission to present our dedicated off-road racers with a great venue, thrilling special events and an incredibly challenging specialized 16-mile race course,” Jackson said. “Something that’s definitely new is we’re bringing the UTVs into the Method Race Wheels race for the first time and we’re having a night race for them,” Jackson said. “So that’s a separate race on Thursday night (beginning at 5:45 p.m.). During their last racing event here, BITD brought back the spectator-popular Laughlin Leap after too long of an absence and many requests to restore it. However, this time it returns with a twist. “That’ll be Saturday night underneath the lights at 7 p.m.,” he said. “The way we’re doing it, is a bracket-style competition. So we’re gonna get 32 teams and it’s a random draw who you jump against. So it might be a truck jumping against a car, or a car jumping against a UTV. There is a bit of a numbers crunching situation required to figure out advantages and disadvantages just in the size of the vehicles and how much space they’ll need to pick up speed. The entry fee is $100 per vehicle. While all of the racers in the UTV category “are in it to win it,” there are some drivers who are strong contenders in the circuit. “There’s always some tough contenders in this division and a young man that sticks out is Seth Quintero,” Jackson said. “He is a Red Bull-sponsored athlete, he’s 15 years old and he’s always at the top of the Turbo UTV class. “Then you’ve got Justin Lambert, who’s always a guy you never count out of any race,” he added. “There’s also Mitch Guthrie Jr., and Dustin Jones, and he comes all the way from Louisiana. Their shop is in Shreveport and they come all the way out here for this event. “There’s the team of Brandon Schueler, which is always a tough team to beat. He’s a multi-year champion,” Jackson said. The tough competitors in the car and truck divisions are pretty slick, too. “Jason Voss is a past champion running in the No. 1 place,” Jackson said. “Then there’s the overall Vegas winner, Johnny Angal — that’s a good battle in the trick trucks for the overall win. “In the 6100, we have a great battle going on between the Mills team, with Taylor Mills out of Texas at the helm; and Ryan Hancock going for a championship there. That is just a taste of what’s in store for off-road enthusiasts when the field of more than 200 drivers go head-to-head over the full weekend of racing. Thursday and Friday are the most spectator-friendly portions of the event when the Tech Inspection & Contingency portion of the program takes place in the Tropicana Laughlin’s back parking lot. This is where race fans will have the opportunity to get up close and check out all of the race vehicles while they weave their way through contingency row filled with vendors showcasing the hottest off-road and racing accessories from the industry’s top manufacturers. UTV Tech & Contingency is Thursday, Oct. 11 (9 a.m.-3:30 p.m.); Car and truck Contingency & Tech is Friday (10 a.m.-6 p.m.). A Method Race Wheels Welcome Party takes place at the Pit Row Hospitality Tent, in the Main Pit area of the Laughlin Events Park, Thursday, Oct. 11 (6 p.m.). Racing action gets underway Saturday, Oct. 13 and Sunday, Oct. 14, promptly at (6 a.m.). Admission for all spectators is a $5 parking fee donation to benefit the Laughlin Volunteers In Partnership. This year spectators may only park at the Laughlin Events Park. There is no parking at the high school. That area will be closed. For more information visit BITD.com. Registration for the Time Trials for Trick Trucks, Class 1500 and 6100, Laughlin River Lodge Riverview Room (6 p.m.-8 p.m.). UTV early tech, Main Pit (5 p.m.-9 p.m.). One escorted practice lap for the time trials, time trials immediately follow (7:45 a.m.-8:30 a.m.). UTV Tech & Contingency, Tropicana back parking lot (9 a.m.-3:30 p.m.). UTV Registration, Laughlin River Lodge Riverview Room (10 a.m.-3:30 p.m.), UTV Driver’s Meeting, Laughlin River Lodge pool (4 p.m.). Races start approximately (6:30 p.m.). UTV Awards, Laughlin River Lodge pool (noon). Laughlin Leap Registration, BITD Box Van (5 p.m.-6 p.m.). Race Day 2 starts (6 a.m.). Cars/Trucks, Awards at Harrah’s Laughlin (7 p.m.).